Plyometric exercises will help your to increase your explosive running power. The 100 meter dash is a sprinting race that requires quick, explosive running to get you to the finish line first. In order to improve your 100m running time, you'll have to increase your explosive power by performing plyometric exercises such as jump squats and bounding. 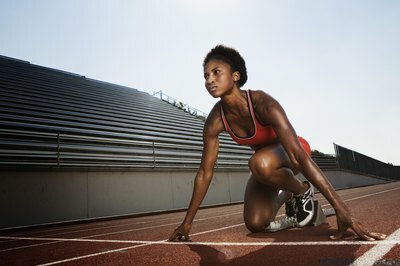 Additionally, dedicate a portion of your training schedule to practicing sprinting at your maximum capacity. To avoid injury, avoid the "too much, too fast" running trap and instead aim for a slow and steady pace increase until you have reached your goals. Walk on your heels for 20 to 30 meters. This strengthens the lower leg muscles and reduces instances of shin splints, explains fitness coach Brian Mac. Lift your right toes off the ground and balance on your right heel. Bend your left knee and lift your left leg until your thigh is parallel to the floor. Step forward with your left foot, placing on the heel down on the floor. Repeat this sequence, alternating legs. Walk on your toes for 20 to 30 meters. Walking on your toes helps you develop balance. Lift your heels and balance on your toes. Bend your right knee and draw your knee toward your chest until your right thigh is parallel with the floor. Step forward with the right foot and place only the toes on the floor. Repeat this sequence, alternating legs. 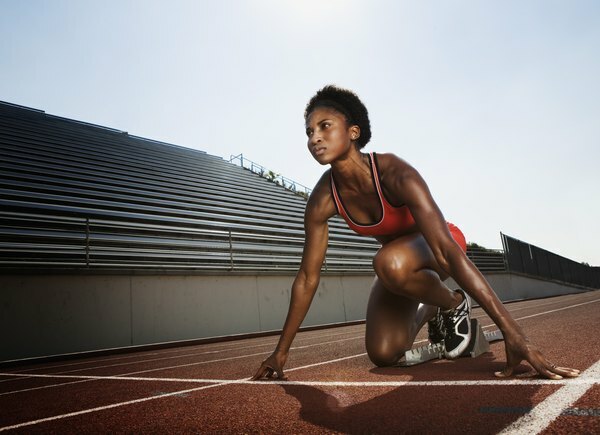 Sprint to your maximum capacity to improve your performance. Maintain good posture with your shoulders back and spine straight. Look forward toward the finish line and keep your elbows bent close to your sides. Explode out of the starting line and run as fast as you can toward the finish line 100 meters away. Always schedule a rest day in between sprinting training. Perform squat jumps to strengthen your leg and buttock muscles. Standing with your legs hip-width apart, bend your knees and lower your hips down until your thighs are parallel with the floor. As soon as you reach the lowest part of your squat, explosively jump up toward the ceiling. Extend your legs and sweep your arms over your head. Bend your knees and land lightly in a squatting position, driving your arms behind you. Perform as many squat jumps as you can in a one-minute interval, working your way up to three rounds. Increase your 100m running time with bounding runs. With bounding runs, you'll push off of the balls of your feet and aim for maximum distance and height with each bounce. Extend your legs out far in front of the body with each stride and try to bounce as high as you can with each step. As soon as the ball of your foot touches the ground, use the force to propel yourself forward. Bound as far as you can during a one-minute interval, working your way up to three rounds of bounding. Strengthen your legs and improve your balance with single-leg hops. Engage your core muscles by drawing your belly button in toward your spine. Bend your right knee and draw your knee in toward your chest, balancing on your left leg. Hop forward with your left leg, as high and as far as you can. With each bounce, try to land lightly on the balls of your feet and immediately bounce up and forward. Perform as many single-leg hops as possible during a one-minute interval. Switch legs and work your way up to three rounds. Always warm up for five to 10 minutes and perform dynamic, range-of-motion stretches before working out. After your workout cool down for five to 10 minutes and perform static stretches. Speak to your doctor if you are new to exercise or have an existing medical condition.